20 free copies of an 18 week journal for leaders!!! At 25, I was pushed into the senior finance role in my division as “controller.” I embraced command-and-control leadership. In 2003, I was tired of giving my all to a corporate world that didn’t care about my family or me. That’s when Ken Blanchard’s influence led me to look at leadership from a servant’s perspective. I faced the reality that it wasn’t enough to say I was going to change the way I lead; I had to change my behavior. I had to move from walking the talk to behaving the talk. 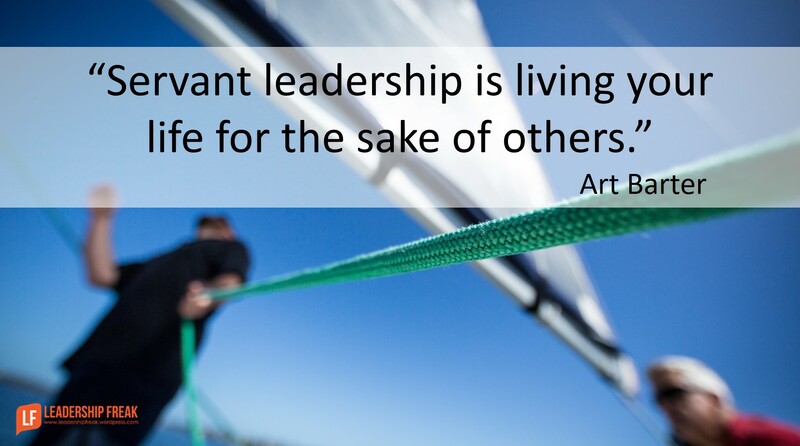 Servant leadership is living your life for the sake of others. You can transform your mindset and motives to serve first — which doesn’t necessarily come naturally. Meet with people one on one weekly. The important measure of serving others is how are people better off after they’ve come in contact with you? Build trust by trusting yourself and extending trust to others. Speak up in meetings to add value. Be transparent even in your mistakes. Give others power to make decisions. Don’t reexamine data others give you. Recognize successes, teach through failures. Values have to drive employee behavior, and that only happens when they understand the purpose behind them. Help others understand why values are important. Invest time sharing your passion in your purpose. Help people understand why you do what you do in business. The behaviors of servant leadership will change your life and the lives of those around you. How might leaders “behave the talk™” of servant leadership? I love the quote “The important measure of serving others is how are people better off after they’ve come in contact with you?” Often times leaders (myself included) get caught up in looking through our own lenses instead of looking at it from the lenses of others. I believe one of the biggest hurdles that you face in servant leadership is when you can equip someone with the tools but they don’t care. Getting to the heart of the reason why someone doesn’t care can take a long time. What do you think is the easiest way to get to the root of the issue? As always….I get so much out of reading your blog everyday! Thank you for helping me become the leader God has called me to step up and be. I agree completely with Keith, people respond to genuine leadership. I always ask, “What did we learn from this”? Great advice. People respond to this type of leadership. Recognize successes, teach through failures. Yes. Great, Dan, as usual. Great how-to advice. I’d love to hear you talk about how lonely this can be too, when you are one of only a handful of leaders at any level working this way. I feel like I’m going through that “valley” now. whatever the origin, whatever the occasion, but the leader as servant rather than friend is a very interesting concept indeed, because the notion of our universal purpose ‘serving growth’ could be extracted from it and would allow us to connect on previously unexplored levels. Great point. Hadn’t thought of it that way as it relates to leadership but well said. Thanks for sharing. In discussions with like-minded friends recently, we talked about leadership from a Biblical viewpoint. Regardless of anyone’s religious beliefs, they would probably acknowledge Jesus Christ as a great leader. One of my friends pointed out how little Jesus talked leadership versus how much he talked about service. I think that is telling. The one that caught my eye was “Don’t reexamine the data others give you.” As one whose data gets re-examined regularly, I agree. However, I always check the numbers and data because I’ve found so many errors. The challenge is extending trust and asking about the data without being perceived as questioning or accusing. I like what President Regan said, Trust but verify. Totally​ agree. Very good point. The ‘upside down pyramid’ of the org hard, with me and our board of directors at the bottom, serving the staff, students and families of our organization has been a model I’ve held to for years. As a leader, ‘it’s not about me’…it’s about adding value to those whom I serve. Thank you for a way to pause and reflect via this journal! Great leaders make time to think and reflect. Seek to serve those you lead and you will be amazed at the service your customers will receive from those you serve! I have been a strong believer of servant leadership for years. I love the concise description of the foundational structures to follow. Thanks for a valuable ‘tool’ to record reflections. I espouse the truth that the strength of a leader comes from making time to think and reflect. Its a journey, but a very rewarding one! Unfortunately I work in an environment where servant leadership is not valued and make one appear weak. Most will refer to you as being passive and attempting to be liked by staff. Please address in another post please address how to stay a servant leader while continuing to model for leadership without becoming bitter and isolating. I don’t want to be hostile and backbiting to get my job done and allow my staff to do theirs without fear. I really like the idea of servant leadership and I plan to use the weekly meetings with my team members to make it a priority. You have to be very confident, secure and self aware to serve those you lead. You can be put in a vulnerable space and have to let go of control and look to empower but when you do people will soar. Thanks for reminding me how important it is to serve others. It seems critically important to meet with more people in small groups and one on one. If I don’t know – really know – the values of the people I am leading, I will likely make mistaken assumptions about the motives behind their behaviors. I believe that it is critically important to meet with more people in small groups and one on one. If I don’t know – really know – the values of the people I am trying to lead, I am likely to make mistaken assumptions about the motives for their behaviors. Servant leadership is so self-reinforcing. When done correctly, it can create a culture of cheerful givers that can’t be stopped. This has been my experience and my observation time after time when I see it in action. It’s fun to be a part of that. I believe in the servant leader and demonstrate that with my team. However, my executive team views my leadership as a negative towards my advancement. They believe I am too motherly in my role as a Manager. When in fact I am giving them the tools to succeed. Servant-leaders are rare; everyone agrees with servant leadership but it’s most challenging to practice. Thanks for these valuable tips! Weekly meetings was an interesting one to me, it is for them, not for you. Never thought of it as servant leadership but it is. And when there is nothing critical to talk about, it is nice to just touch base and connect about how they are doing and feeling. Great topic – this is something that I think many leaders – current and new – struggle to understand. Leadership serves others by making them successful. Get people in the right seat on the bus (from Good to Great)–then train, equip, and most importantly, CARE about their success. “People don’t care how much you know until they know how much you care.” At the heart of servant leadership is genuine care for others – for their well being, for their personal and professional success. You can’t fake caring for others – people are very observant – you won’t fool them on this. Serve first – give without expecting anything in return. Build trust – first demonstrate you are trust worthy. Live your values – if you value people, your focus is more on them than on yourself. Having recently worked through a reorganization in our department and assuming responsibility for new team members, the transition has not been an easy one. I have always been a servant leader and do all that I can to support the team while equipping them to move the work forward. However, there are members of the team who are “new to me” while not new to the department, most of whom have been here longer than I, who do not seem interested in a connection or my help. It’s not easy to want to help and be dismissed by those you supervise. Finding a balance is not a natural strength for a servant leader. I always enjoy sharing your content with co-workers. I’ve come across a very interesting dilemma as I’ve tried to teach leaders the servant leadership model. Many people have a hang up about the word servant. They have a deep-seeded belief that ‘servant’ = ‘doormat’. The challenge is to get leaders to see that if they serve first, those they serve will engage more and not try to take advantage but that leap of faith is pretty big for many folks. I believe that knowing, living, and sharing values and purpose are crucial to the process of moving from command and control to servant leadership. I have and my organization is a Servant Leader junkie. There is no other Leadership profile than the Servant Leader. Your purpose in any leadership role should be to serve and add value to whatever the situation. If serving yourself or being served is someone’s mindset in a Leadership position, they are NOT a Leader but a dictator or consumer. My organizations have grown internally first through the application of Servant Leadership management and had a huge impact on the external deliverables every single time. The caution to everyone is the jealousy others exhibit once they see the results and the enthusiasm of the team within your organization or unit. “Servant leadership is living your life for the sake of others. Such an important reminder of a simple, yet challenging, truth. Servant leadership. I wonder why we include the word leadership? Is this because we all like to think in terms of leadership – we’d rather be in front than somewhere among the followers? Jesus said, “The kings of the Gentiles exercise lordship over them, and those in authority over them are called benefactors. But not so with you. Rather, let the greatest among you become as the youngest, and the leader as one who serves” (Luke 22:25-26 ESV). Here’s the idea. The call is to service. To put others first. Do this and one can transform an organization. Servant Leadership requires transparently more than another leadership style to be effective. The Servant Leader must connect on a personal level and be open and honest sharing their “WHY” or purpose behind their actions. Once followers believe the Servant Leader ultimately has their best interest and the best interest of the organization as a priority no challenge is too great. OTOH – if the Servant Leader does not share their “WHY” no one will understand because the Servant Leader runs counter to most other leadership styles and models. People need to buy into _why_ they need to behave in certain ways, otherwise it’s just soulless duty. We integrate the Servant Leadership concept into our Professional Sales curriculum. This short summary will be helpful and I am sure the journal will also. Thanks for sharing Dan. The “behave the talk” actions are great and certainly gave me pause to consider how I can become more effective as a servant leader. People need to know you care and in order to Trust someone you need to be the 1st one to make the move. An example of behaving the talk of servant leadership is to talk to your people about, and care about, their personal development goals and not just their professional development goals. Be yourself around them and acknowledge when you make mistakes. Another example is to always find ways to give your people credit and lift them up. I know I have to get better at meeting with my employees more frequently. This provides an awesome goal of once per week! Thank you! I struggle with the weekly meetings. Leading 71 people makes the weekly contact very difficult even every other week is tough. I can feel myself pulling back on the servant leadership the more stressful my job becomes at times. Reflection usually helps but it is much easier to say than to do. A mentor said it this way, “Make the successes of your team your successes.” In other words, when they succeed, that’s when I’ve succeeded also rather than it having to be about me as the leader. Love that! Thanks for sharing! One of the things that I think people overlook sometimes is that service itself IS leadership. It’s not about motivating people to get things done, a servant leader builds a team environment where people motivate themselves. To do this successfully, however, a servant leader must have excellent listening skills to help understand how to support his/her team in achieving their goals. Great article!! Getting people to let go of their ego, and giving them the confidence necessary to make themselves vulnerable are my two main challenges as a Coach, and these steps will be an invaluable resource to me in trying to serve my clients. Thanks for sharing! It is interesting in that this seems so obvious, yet is so difficult at times when things are time sensitive or highly stressful. Gets back to putting others before ourselves and then they will follow. Excellent post – have been pursuing servant leadership for years in ministry, now in my workplace as well. Thank you! Great post – I coordinate a leadership book club at work and I just ordered your book. I think it will be a great fit – thanks for sharing! My purpose as a leader is to become a source of growth for the people I SERVE. I am a SERVANT Leader! Love the post. I would like a book. I think that this is a very valuable resource in becoming a very good leader. I LOVE bullet points. And these are brilliant. I work with leaders ready to transition their team and their own leadership to high-performing impact on themselves and their organizations. And have to admit, had not included the servant leadership theme – it should be front and center! This is a great way to start. THANK YOU! Great thoughts on servant leadership. It’s too bad that command and control leaders don’t appreciate the servant leadership model. I appreciate your shedding light on it! Leading is a privilege and should e treated as such. We owe our staff this. I’m a big proponent of Servant Leadership. In my organization, I find managers think it’s old-hat and that they already work that way. Sort of, but not really, is what I say. It’s not something that happens quickly, it takes a lot of time to first work on your own mindset and behavior, and then to have it be second nature in all your day-to-day work interactions. I’ve had some leaders then take on too much care and responsibility for their staff and not let them grow and learn from more responsibility. These leaders tend not to delegate well. It’s a process to get them to understand that protecting your staff too much and not teaching the realities of the organization puts them at a disadvantage. So you’re doing them a disservice if you don’t delegate responsibility and jump in to fix everything. It’s a gift to be real with staff – support them but let them fly. Servant Leadership isn’t easy, but it’s worth the effort. Love the title Servant Leader! I believe we could all practice this more often. It’s far too easy to get caught up in the day-to-day processes which allows us to forget that we are truly a servant to those who we mentor and ‘serve’ along our path. One standout for me was the recommendation under Building Trust, actions that extend to others, “recognize successes, teach through failures”. I look forward to reading more from Art on this topic. Choosing to serve with a purpose. Thank you for the great read and reminders of why Servant Leadership is important. Stop playing on your computer/phone, get out of your cubicle, start talking to people and use your connections/talents to help them. Would love to read more about what he has to say. Great post as always! True “servant leaders” can be hard to find but you can always pick them out quickly when you see one. My company just introduced the idea/concept of servant leadership. I hadn’t heard of it before. I love how Art breaks it down into actions we can demonstrate (and may already be demonstrating) in our professional and personal lives. Hmm, the post says “tired of giving my all to a corporation” which sounds like serving to me. Is the issue about exploring who/what you serve and why? Perhaps the heart of the matter is serving people. I work in the government sector so serving people extends beyond those I work with, and also to serving the residents and community. Liked the post and its contents. Servant Leadership is well defined with 3 most essentials as rightly put! I may add one more point in the list of essentials i.e. Satisfaction with A Solution. The leader needs to ensure that he is able to provide the right satisfaction to the internal and external customers with adequate solution to meet their expectations at the end. Satisfied customers then give repeat success with accelerated growth! Living your values is so crucial! I always give more when I know the “why” and have seen others work that way as well! Great content!! Behave the talk is such a great to walk the walk. Can’t wait to share it with my college seniors! Good post, Dan. Recognising that leaders should be there to support and empower others is sadly often missed by people in positions of power. Regaining trust is also a hurdle. I am interested in more detail of the how to accomplish each of these. Recently I was asked from an outside firm what type of leadership approach I take when leading others. Servant leadership is the answer. Thank you Art for sharing and may you have continued success! One of the best tools I have learned and use for building trust is the Trust Equation – Credibility + Reliability + Intimacy / Self-orientation = Trust. The more you can focus on others and move away from self-orientation the more trust you will build with your team and others. This is exactly the goal of servant leadership. Giving a hand up before asking for a hand out. What a great post this morning! I spent 30 years in the Air Force and championed Servant Leadership when I was put in positions of influence later in my career. Yes, even in the military, the tenets of Servant Leadership can have huge, positive impact! I first heard of the term “Servant Leadership” while attending a Christian college. One of our courses taught what it means. Servant Leadership is summed up as living your life to serve others. Our role as leaders is not only to get the work done, but to build our team and provide them with the necessary tools, knowledge and confidence they need to become better leaders. This article was perfect timing as I was just talking the other day with a co-worker on what it means to be a servant leader. Awesome article and great job summoning up this leadership style. I am not sure how Servant Leadership connects with Symbolic Leadership where one can lead without even noticing that people are following/imitating him/her. In that case, is one supposed to consciously hunt for people/situations that s/he is influencing? Great tips on not only being a leader at work but a leader in life and marriage. Apologize when necessary don’t have a chip on your shoulder, be transparent in your mistakes and take accountability for your actions, help others understand your values and how they drive you daily to do what you do. I am a subscriber to servant leadership in my position. I would like to be able to encourage my peers to do so also! I think I developed as a servant leader in the #2 role I filled for several years, now being in the #1 role it comes naturally to make sure that my team understands that their success is of the utmost importance within my organization. This follows in my personal life as well as on the boards and committees I serve on. Being completely authentic is a critical component, in my opinion. It smooths the critical path to trust. It also forces us to be vulnerable which can lead us to heightened awareness and growth. I am grateful for the reminder that for others to trust you, you also have to show you trust yourself, and can communicate that in tune with values. Thanks for that. So much of what we do revolves around being a “servant”. Oftentimes people do not like the use of the word “servant” and substitute another. For me, you can use what ever word you prefer, but servant leader captures it best. Whether we are talking about preparing people, coaching them, mentoring them, helping THEM achieve their potential as they and we see it, all of those revolve around recognizing that those that work with and for us are the greatest resource we have. True leaders recognize this and are always sharpening their own skills, as well as those around them. That is service to others both internally and externally from whatever business we conduct. I currently work in an environment that has lost sight of the importance behind servant-hood. I would love to learn more about servant leadership and how to implement it into my own life. Beautiful. Enable others. Inspire vision. and Model the way. I have been an administrator for over 20 years…the last four in the district office. I have always tried to live up to being a servant leader and encourage all the secondary principals to model and lead by example as well. Leadership is an honor not a right. Come June, I am retiring after 39 1/2 years in education. I feel blessed to have had so many servant leaders and mentor throughout my career. The young lady that is taking my place to lead the secondary team is equally a servant leader. She will do great! I am proud! It is so important to live your values. People are drawn to leaders that stand by what they believe even if they don’t necessarily agree with them. Really helpful thought here. Especially resonating with your points in #2. Thanks. Great post, the biggest challenge I experienced is when those I reported to did not believe in servant leader approach. They preferred to be Hippos …Highest paid people in organization and felt team should serve them. Servant leader is by far the best approach if you serve on a team with leaders who have a high EQ. After a 40 year career and still having 10 years to work, I am truly looking to live my values and become a servant leader. There is a difference between Leadership and Management. Management clearly do not understand what is written in this article. Thanks for the encouraging and challenging blog. I always walk away better in some way after I’ve read it. Keep up the great work. Fakeness stands out a mile. Be who you are not who you think you should be. Great concept. I always practice this!!! Having seen command and control and servant leadership both in action, I learned that servant leadership helped me develop better policies, guidelines and increased productivity and morale exponentially. Kudos to all those who practice servant leadership. Living and working on two worlds: healthcare and non profit, i have seen the good, bad, and ugly approaches to leaderahip. This summary provided above, is affirming and challenging. It cuts through classroom theory and goea to the heart of the matter. For it’s the heart that matters leadership. Three levels of leadership I have seen and participated that has produced great results. 1) Innovation and the point of discovery. On this level everybody on the team has skin in the game and gets to play. 2) Empowerment and delegation. This level, direction has been determined and a plan has been agreed upon. 3) Observation and critique. This level is purely maintenance, which just about anybody can do if they don’t mind working with tunnel vision. All three of those levels CANNOT function properly if one is not willing to help in some form or fashion, someone else have success. My team’s success or just one member having success, if I or anyone else on the team can help another reach their goal, we all win. The Lone wolf, me, myself and I glory hound mentality really belongs in a duck blind tied to a polecat with no shotgun shells. In short, servant leadership is nothing more than serving those around you as you lead by example, do to others as you would have others do to you. Allow everyone to grow and excel in their strength and not burden them with the mundane of their weakness. Servant leadership is a core to what we strive to practice in Lutheran School administration. In a faith-based ministry, it is at the absolute foundation, belief-driven, that we serve others. The leader sets the tone and models through leadership style and choices. I find it far more fulfilling than any other alternative, as well. Great post! As I prepare to go into a couple of meetings I think about some of the principles you shared: to speak up to add meaning/value! I never thought of it that way. I tend to keep quiet when others share often or loudly, or in whatever way that makes me feel a tad like I have nothing important to share. Thanks for the encouragement and insight on Servant Leadership! I need to share my passion with others and they will understand my values and then maybe they can value serving others better. Thank you so much for this wonderful article. These principles give great instruction to those who lead and guide others. This is the very foundation in which we strive to serve others daily. Not only can these principles be applied in our work world but applying these principles in our personal lives can absolutely make a difference in how we deal with one another. Thanks for the guiding and encouraging words! Wow! This is so timely for my wife and me. We are embarking on a new challenge and building a new team. Our hearts have always resonated with servant leadership and our most significant mentors and influences have been servant leaders but, on the edge of a new challenge, it is tempting to lean toward “command and control” to give an impression of much-needed certainty. I know that is not fruitful but the quote “The behaviors of servant leadership will change your life and the lives of those around you” hit me like a train! This is exactly what is happening for us and confirms the direction we are taking. Thanks AGAIN Dan, and thanks, Art, for communicating liberating truth so clearly and simply. This = Recognize successes, teach through failures. I love this thought, “The important measure of serving others is how are people better off after they’ve come in contact with you?” I try to lead each day with the goal of making a positive difference in the lives of those around me. One way that leaders, and I, can behave the talk of servant leadership is to remain self-aware, yet others-focused in the midst of conflict. Asking the right questions serves the other party(s) and the values of the organization. Contrast: Cut the conversation short, minimize, or enforce by position. Only listen in order to respond. Be sharp. Be right. Consequence: Win or eliminate the ‘battle’ but loose the war. Servant Leadership is about what’s important over there with each person you lead or serve. It’s important to invest the time in learning what’s important and then offering appropriate support. That’s how love-based leadership works. I believe Servant Leadership naturally gives leaders access to the 4 behavioral elements of Transformational Leadership which leads one toward shared governance – a truly revolutionary leadership approach that really works to ignite engagement and performance. At the end individuals’ behavior define corporate culture, the cultures takes time to develop and change and so are the behaviors. Servant Leadership is understanding that the position of leader is a position on a team or group. Although the responsibilities may be different, leaders are not better or above the team. They play a role just as a secretary does or a janitor does. My role as leader does not make me more important as a person. I have a responsibility as a leader to maintain the culture of a team that honors everyone. Thanks for this post on servant leadership. I consider myself a servant leader, however one of the challenges I face is that not all team members will embrace that. Some team members consider that as a weakness and will attempt to test my patience, purpose, and even their integrity. I find myself having to really motivate myself to realize is it really worth my time anymore once people have made it up in their minds through their behavior that they don’t want to grow. Although it is challenging, my resolve is to keep moving forward and impacting those who are receptive and realize some people may have to be influenced by others and that’s another person’s assignment. Art you touch my heart! I am 30 and really am just starting off in Leadership. I have found that as a child who grew up with technology it is challenging for me to often be relational first and informational second. I LOVE what I do and the people I do it with, however despite that I’m not always putting my value’s first. and top of the is the LORD and the values he wants me to lead my life by. I recently attended a training on Transformational Leadership. Where we needed to identify our values and discus how we would lead through them, however I feel just as importantly as that is knowing how to SERVE through them. How can we expect to lead like Jesus if we do not serve like Jesus. What a great article with some truly applicable advice. This is very good stuff! Thank you! Great insights. It’s almost commonsensical however talking the talk is much easier than walking the walk or “behave the talk™” as mentioned in the article. It’s hard to change the behavior of “Do as I say NOT as I do” and start leading by example. I can imagine this worked equally as well at home, this way you’re not treating your wife and kids as an employee (or the boss;). I guess it comes down to seeing people for who they really are and encouraging them to grow from that place. Having a serving attitude towards them is a good way of watering that part of the garden. Good recommendations in particular asking yourself how did my interaction with a colleague improve their situation?